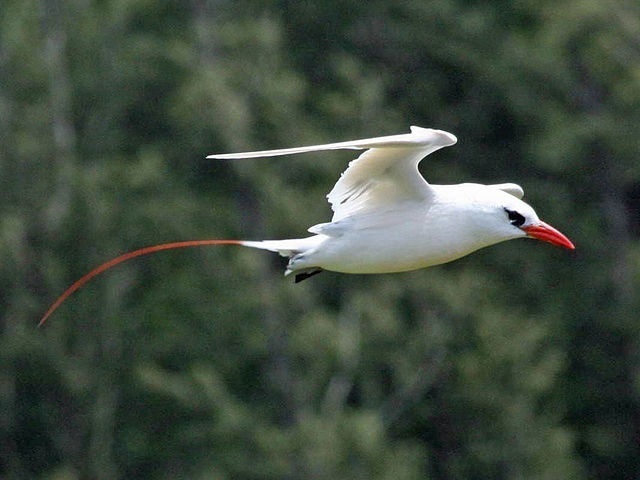 (Seychelles News Agency) - Aldabra island’s red-tailed tropicbirds are declining due to predators attacking their nests, a researcher at Queens College in Oxford said following a scientific expedition to the remote atoll in Seychelles. Annette Fayet said that the attacks on the tropicbirds’ nests are extremely high and can be attributed to the low breeding numbers. “We have discovered the presence of black rats on the islets in the lagoon where the birds breed and they are preying on the nests and eating the eggs as soon as they are left unattended,” she said. Fayet said that the predators, which include crows, are also attacking the nests even when the parents are present. The red-tailed tropicbirds, called ‘payanke lake rouz’ in Creole, got their name for their greatly elongated tail streamers, which are boldly coloured red and can measure up to 35 centimetres in length. The feathers on the rest of its body are white. The species lives alone and normally away from any form of land, out in the mid-ocean. As part of the research, Fayet had to understand the feeding ecology of the tropicbird and how that affects its breeding success. “We have found interesting results about the foraging movements of breeding tropicbirds. We found that during incubation, the red-tailed tropicbird travels hundreds of kilometres away from Aldabra to feed, and they will spend one week at sea while the partner sits on the egg,” said Fayet. The expedition took place when the birds were breeding on the island from December to January on Aldabra, one of the UNESCO World Heritage Sites of Seychelles, an archipelago in the western Indian Ocean. Although the state-of-the-art technology was used to track the species' feeding movements Fayet said that she encountered some difficulties. She said that due to logistical issues during the project, the expedition could not collect accurate GPS data from the birds, and so it has not been possible to link specific foraging strategies with breeding success. “This has also been made very difficult by the very high failure rate of nests - essentially preventing a comparison of successful and unsuccessful nests. We have refined our methods for GPS deployments and hope to try again in 2019,” said Fayet. As for the recommendations to ensure the continued survival of the species, Fayet said that there need to be experiments to measure the impact of predators on breeding success. With regards to the crows, Fayet said it is more difficult as they are native predators. “We have only just found out about the impact of crows on red-tailed tropicbirds and our sample size remains small, so we will first try to gather more evidence of their impact on red-tailed tropicbirds before discussing potential plans of action,” she said.